A few months back I had first written about her - how she tasted empowerment just by dancing for an evening with a group of fellow rural reporters . For years, it was something she longed for. Now, back to village, she is voicing the same longing and feelings of other women like her, living in her own village of Walhe, Maharashtra. 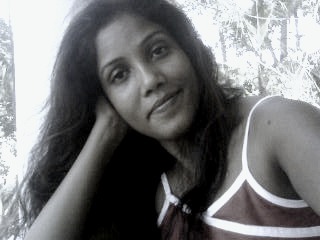 Meet Rohini Power again - this time as a community correspondent who can command anyone's respect. Nag Panchami or the Snake festival has a totally different meaning for women in Walhe village of India’s Maharashtra. Rohini Powar, who lives in the same village, says that it is the only day of the year when married women like her are allowed to dance and play games, while for the rest of the year they are forbidden to do so. Rohini, now a community correspondent of Video Volunteers' IndiaUnheard program, has just filed a video report that gives us an exclusive insight into this tradition which allows a rare chance to women in her community to enjoy freedom. In the rural belt of India – a patriarchal society – women labour harder than men do, their areas of work stretching from home and kitchen to the paddy fields. Yet their lives are dogged with problems such as female infanticide/foeticide, early marriage, dowry, forced divorce, malnutrition, poor health and lack of education. These are endemic problems existing in all states, irrespective of religion and communities. In Rohini's village also women are treated as inferior to men. So while men are free to do whatever they want, women’s movement is restricted and they must take special permission from their family members even to step out of their homes. They are especially forbidden to sing, dance or play in public view. Those who do so, are looked down upon as women of loose morality. 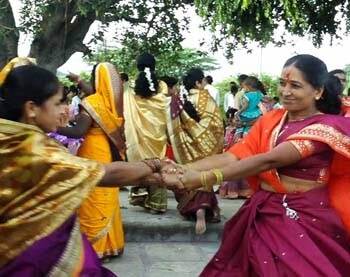 However, once in a year – on the day of Nagpanchami this bar is lifted and women are expected to dance and play games. So this day local women gather at the snake goddess temple to worship. However, what they really wait for is the moment when the worshipping is over and dance and games can begin. Once that moment comes, everyone joins in dancing and playing – acts that are otherwise considered a taboo. Rohini says that throughout the year women like her look forward to this day when nobody will shout at them for dancing or, nobody will accuse them of breaking a tradition by playing. However, after this day, they will have to return to the life of restriction again. Rohini feels that this must change. She wants the patriarchal society to change its thoughts and values, so that women like her will not have to enjoy for one long year to enjoy a day’s freedom.